The three Ws that established Camden as an agricultural centre only lasted for a few decades. What made that period of agriculture so bizarre is that it established agricultural industries within Australia but the viability of the crops and livestock in the Camden area were short lived. It would be in the 1880s, when dairy became the primary industry, that agricultural longevity came to the region. Although the surrounding areas have undergone and continue to experience urban development, the centre of Camden is still a testament to the dairy heritage of Camden. In a way it was a return to the original agricultural inhabitants of the land, with the wild cattle that led to the discovery of “the Cowpastures” returning as domestic livestock to bring the area to agricultural fruition. Apart from the fields that still surround the town of Camden, there are other indicators of Camden’s dairy history. The strongest is the old Milk Depot. It was constructed by James Downie Rankin in 1896 and designed by Sydney consulting engineer W.W. Crawford, who also supplied the machinery. A separate, although no less significant, structure was the Camden Refrigerating, Butter Making and Bacon Curing Works. As the name suggests, this is where the dairy was churned into butter and the pork cured into bacon for the Sydney markets. 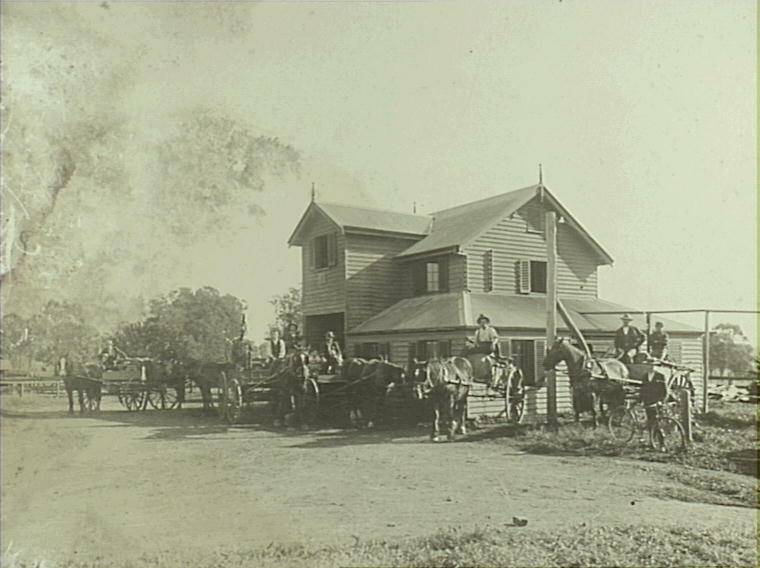 Before this building was constructed, farmers went to the Menangle Creamery located at Camden Park. The Menangle Creamery, although smaller, was considered one of the “most compact and best designed structures of its time” (Johnson, 2011). Sadly there are no photos of the Refrigerating, Butter Making and Bacon Curing Works remaining. The building suffered extensive flood damage in February 1898 and was not reopened (Back Then, 2011). The Menangle Creamery located at Camden Park. The Camden Refrigerating, Butter Making and Bacon Curing Works is a strong reminder that although dairy is so linked to the modern agricultural image of Camden, it was not all smooth sailing. 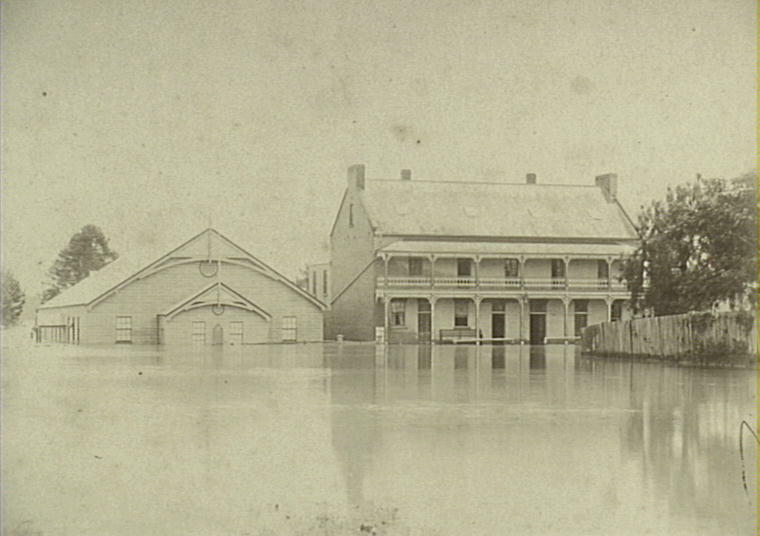 Flooding was a particularly hazardous and regular occurrence, with the area immediately surrounding the main town of Camden being called the flood plain. A prime example of this style of land is the Camden Town Farm, which was originally a 52 hectare dairy farm owned and run by the Davies family from 1915-2000, with Miss Llewella Davies, the daughter of the dairy farmer, bequeathing the land to Camden Council in 1999. Although an issue for the farmers, the floods never destroyed the dairy industry in the way the 1840 drought brought the Macarthur wool industry in Camden to an end. Flood water inundating Drill Hall and Crown Hotel, at corner of Argyle and Murray Streets in the centre of Camden. 1898. In addition to flooding, disease caused its fair share of problems. These bouts of disease and pests were never as severe as the rust that demolished the wheat industry in the Macarthur region. It has however continued to create distress in modern times, with viruses such as bovine ephemeral “three-day sickness” (Priest, 2013) and akabane virus (Ward, 2007) surfacing as recently as the last decade. Viruses and climate were not the only threats to livestock. There were bushrangers in the area, and cattle theft was a particular specialty (Sidman, 2007). More recently, the supermarket price wars for dollar milk created economic problems with many farmers like Tony Boffin and John Farley encouraging a stand in support of local produce (Stillitano, 2011). Despite all these hardships, success for Macarthur dairy continues, with companies such as A2 Milk opening up a $8.4 million processing plant in 2012 (Dougherty, 2012). 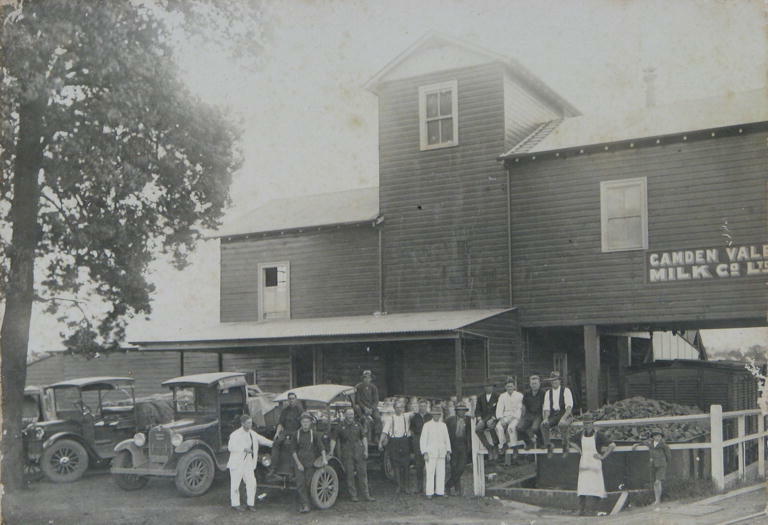 Dairy may be the cornerstone of Camden’s agricultural prosperity but other crops and livestock were farmed and contributed to the area’s wealth. Even in the early days producers as varied as orchardists, poultry and pig farmers, and market gardeners all supplied produce for the Sydney Markets (Villy, 2013). After the mid-twentieth century, the industry of the area began to diversify further. One of the more unexpected additions was angora, with local farmers seeing the new possibilities of expanding this industry (Golden Goats of Narellan). The most striking change in this millennium is the rapid urbanisation of the Camden area. And although agriculture’s place as the primary industry of the Camden area is being shifted to new industries, it is a testament to the area’s fertility that it created agricultural industries that not only brought the area to prosperity, but contributed significantly to the birth of Australian agriculture. Dougherty, Scott. (12.9.12) Cheers to Milk Factory. Camden Narellan Advertiser. Johnson, Janice. (19.9.11) Camden’s Butter Making and Bacon Curing Enterprise. Back Then. District Reporter. n.a. (26.9.11). Correction. Back Then. District Reporter. n.a. (n.d.). Golden Goats of Narellan. Macarthur Leader Magazine. Priest, Evin. (22.1.13). Help Beat the Fever. Macarthur Chronicle. Sidman, G.V. (26.10.07) Bushman and Cattle Theft. Back Then. District Reporter. Stillitano, Iliana. (16.3.11). Supermarket Games Milk Dairy Farmers of a Viable Livelihood. Camden Narellan Advertiser. Villy, Elizabeth. (1.2.2013). Farming in Picton in the Old Days. Back Then. District Reporter. Ward, Matthew. (12.6.07). Beware of Deadly Bite. Macarthur Chronicle.